Product, once it has been spooled, needs to be unwound, de-spooled or dispensed on the next process. 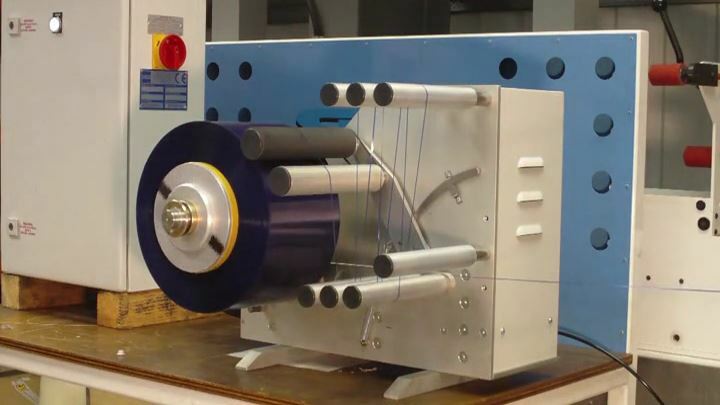 Double R Controls Ltd. can provide a wide range of de-spoolers/unwinders having the capability of unwinding either adhesive or non adhesive material. The range of equipment that we provide covers product widths from 1 mm up to 150 mm. 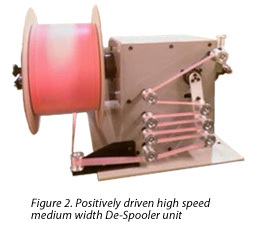 The principle of each of the de-spoolers/dispensers is to unwind the material and present it to the next process in a fixed line and, therefore, the equipment has to eliminate the traversing action of the spool. The equipment can range from a simple braked narrow width unit (1 mm to 10 mm), as per figure 1, to a positively driven high speed medium width unit (10 mm to 50 mm), as per figure 2, to a wide width unit (50 mm to 150 mm), as per figure 3. 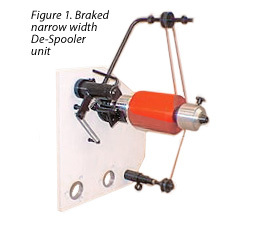 The de-spooler/dispenser has to be chosen for a particular application and product to be processed. However, from the wide range of equipment available we can select a unit that will meet your requirements. Video: Desktop Driven De-Spooler Unit. Video does not contain sound.